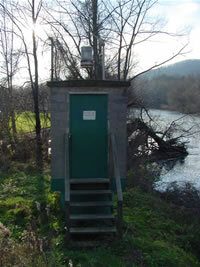 LOCATION.---Lat 41`56'17", long 79`08'00", Warren County, Hydrologic Unit 05010002, on left bank at highway bridge at Russell, 0.5 mi upstream from Akeley Run, and 8.0 mi upstream from mouth. PERIOD OF RECORD.--October 1939 to current year. Monthly discharge only for October, November 1939, published in WSP 1305. GAGE.--Water-stage recorder and heated tipping bucket precipitation gage. Datum of gage is 1,221.77 ft above National Geodetic Vertical Datum of 1929. Prior to Apr. 10, 1941, non-recording gage at same site and datum. Satellite telemetry at station. COOPERATION.--Funding for the operation of this station is provided by the U.S. Army Corps of Engineers, Pittsburgh District, the Pennsylvania Department of Environmental Protection, and the U.S. Geological Survey. REMARKS.--Flow regulated by Chautauqua Lake. Supplied by NWS: Action Stage-7 ft; Flood stage-9 ft; Moderate flood stage-10 ft; Major flood stage-10.5 ft.